MyWay is the new way to move and store. Whether you’re moving straight into a new residence, looking to clear up closet space or anything in between, MyWay is the answer. We can bring storage units to your home, business, or any place you may need. When the storage containers are loaded, you can either keep them at your place or we’ll pick them up and store them in our state-of-the-art storage facility. Let us know when you need them back and we’ll deliver them right where you want. You’re in control and we think that’s the way it should be. We never forget about lending a hand to a Pittsburgh community that has given us so much. We believe MyWay has the ability to make a positive influence in Allegheny County. The difference can come in any form, from a friendly smile to a customer going through a troubled time. We also support charitable donations to local organizations. 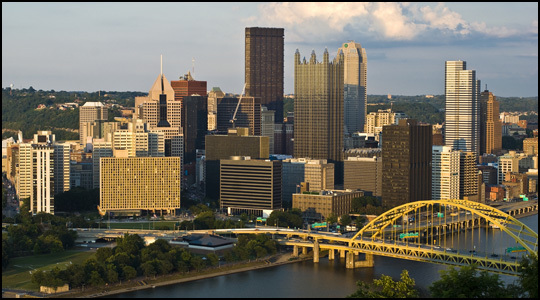 Pittsburgh has been our home long before our place of business. Our mobile storage containers can be used for a variety of projects and needs that accommodate you. Not only are we the most convenient and cost-effective moving solution, but we can also be used for short or long-term storage. We can bring your mobile storage containers back to our climate controlled storage facility, or keep them on your property if you need daily or weekly access to your belongings. "It's affordable, it's convenient and it's something I tell all of my friends about. If you need storage of any kind or a moving solution, give MyWay a call." "It's affordable, it's convenient and it's something I tell all of my friends about. If you need storage of any kind or a moving solution, give MyWay a call." - Jim R.
"Forget about having a storage unit, MyWay has a new type of storage that makes all the sense in the world. Thanks for letting me get my garage back." "Forget about having a storage unit, MyWay has a new type of storage that makes all the sense in the world. Thanks for letting me get my garage back." - Tama H.
"In the past, I rented a storage unit 15 miles away from my house, now I use MyWay and they deliver my storage SafeBox(s) to my house as often as I like." "In the past, I rented a storage unit 15 miles away from my house, now I use MyWay and they deliver my storage SafeBox(s) to my house as often as I like." - Bret B. "The Annapolis Running Classic has used MyWay Mobile Storage for several years. With so many moving parts involved in putting on a half marathon and 10k for 3,300+ participants, we need to have the peace of mind that we have a safe place to store finisher's medals, medical supplies and other equipment to ensure that the runners have a positive, safe experience from start to finish. As always, the MyWay units were delivered quickly and placed exactly where we needed them near the finish line and main tent by their courteous driver, and picked up after the event. We can't say enough about how positive every experience we have had with MyWay has been over the years." "The Annapolis Running Classic has used MyWay Mobile Storage for several years. With so many moving parts involved in putting on a half marathon and 10k for 3,300+ participants, we need to have the peace of mind that we have a safe place to store finisher's medals, medical supplies and other equipment to ensure that the runners have a positive, safe experience from start to finish. As always, the MyWay units were delivered quickly and placed exactly where we needed them near the finish line and main tent by their courteous driver, and picked up after the event. We can't say enough about how positive every experience we have had with MyWay has been over the years." - Lisa F.
“This is an excellent solution for storage during rehab! The number of pods is flexible and they they are flexible on timing of the drop and pick-up. the driver knows how the move the boxes easily to exactly the location needed. Will gladly use use them again when needed.” -Grant H.
© 2008-2019 MW Equity, Inc. All rights reserved. MyWay & MyWay Mobile Storage are registered trademarks of MW Equity, Inc.